OUR PRICE: $45.82 - Join Rewards Get $4 Dance Dollars On This Item! Bloch's "Elasta Bootie" is a laceless gore boot with longer bottom pleats and features a shorter footprint shaped pad for a better fit. 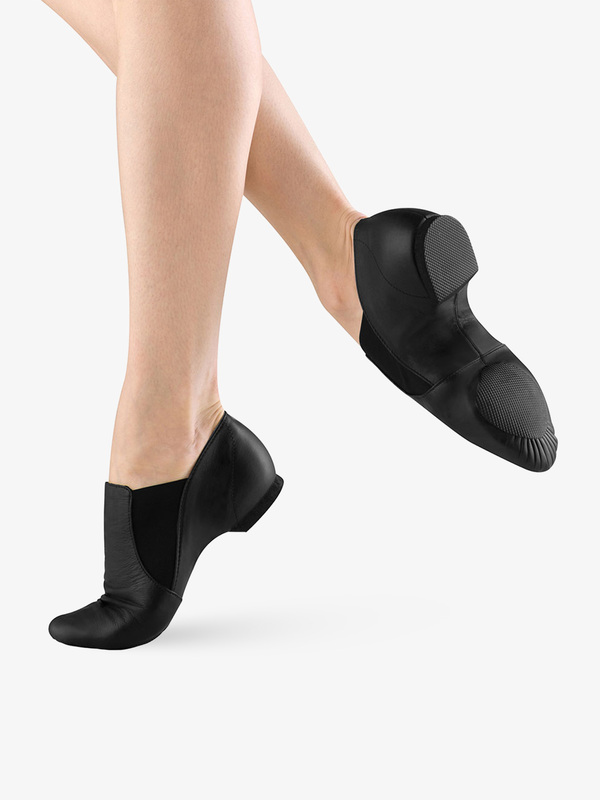 I order these jazz shoes for my daughter in size 6 and a half and also the Tap Flex shoes in the same size. The Tap Flex fits right but I had to return these because they are too tight. I have to order size 7 instead. They scuff very easy but she likes to wear them. Another bad thing was this order took almost two weeks to arrive now I have to return the shoes. The shoe seems good but had to return for different size. Child's shoe size is a 6 and the size 7 Jazz Bootie was too small. Ordered a 7.5N fits like a 8.5 M.. Size chart on this site is different from Bloch's. Please double check sizing!!! These are my favourite jazz shoe so far! I just love these, so comfy and affordable! I got my shoe size and they fit perfect! Before I had Capezio buckle pedinis in the same size and they were to large and the buckle was uncomfortable. Highly recommend these! I have been dancing in them for years and they last a very long time. I would recommend them to anyone! If you are thinking about lace ups, don't be a fool, get elastic- it is what real dancers wear! It still fits good on me. I have this shoe in tan and I've had it for six years. It still fits good on me. The side gores are already dirty and dark. Still a good shoe and a good fit after six years! I have these in black and I love them! I have a very high arch and these are the only jazz shoes I have found that give me adequate support. They feel very snug and really hug your foot. The only reason I gave 4 stars was because mine didn't stretch enough after I bought them, so my big toe was often sore after class. But overall these are GREAT! I REALLY like these shoes! They last a pretty long time, and are comfortable! I have them in black and tan and enjoy both pairs. 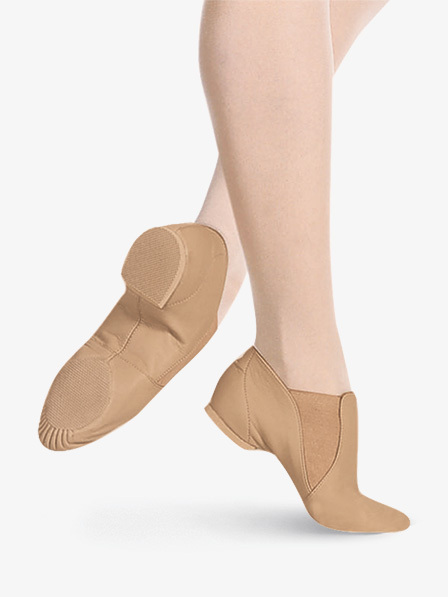 The tan matches Bloch tights also, so it looks good in class! I've worn the Capezio version for years... until they changed/updated the model. I bought this instead and I am extremely happy! Bought this in a tan, same as street shoe size. These shoes are great! Way better than regular lace up jazz shoes. But, they lose the traction and hardening on the heel in like 3 uses. But I love when jazz shos do that because it makes them flatter and softer. But hey, for me it's a 5 star rating, but if you don't like it too soft and wear out, don't buy them. I'm in jazz classes. They work like a charm. I would pay $100 for 10 pairs of them. I've been buying these shoes from my dance studio for five years. They work very well for me and feel nice on my feet. I don't remember really what other kinds are like, but these work very well, especially on our Marley floors. I love these shoes because they are great for turning. They feel great on your foot and are very comfortable. They are easy to wear in when you buy them. They always give me good luck at performances! I wish they came in a suntan color too. I love these shoes. While it is true that the friction on the shoe wears down and becomes slippery, it is perfect for marley flooring. These shoes last a long time. I have had mine for 4 years. Same fit as other Bloch? I've worn the S0401 super jazz shoe for years but really want to try these. Do they run the same as other Bloch jazz shoes? Can I order the same size in these as I do for the S0401? Hello! Thank you for contacting us. The fitting suggestion is the same for both but keep in mind that the sizing differs even within the same brand. Each jazz shoe varies, however for this item we do suggest women and children fit to street shoe size. Please know that this is just a sizing suggestion and is not guaranteed. How do you know if you're an N or M in foot width? If you find that your street shoes run a bit wide on you, or if you typically buy narrow shoes, you will want to go with a narrow width. If you do not typically have a problem with width, in regards to shoes, then the medium width should be fine.